Check out this cool inflatable snow house igloo. If you love the snow, then this toy snow fort is for you. Hide out in this adorable fort made of durable cold resistant pvc. 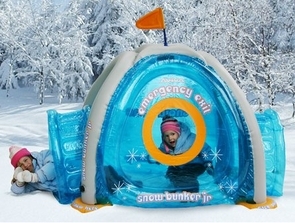 The full size toy snow fort features a door and a window and hours of outdoor winter fun. Perfect snow fort for the winter months and can be brought inside the house to play with as well. Shipping is a little more on this item compared to others as it weighs over 26 pounds. Inflated it measures 72 inches long X 60 inches wide X 57 inches high. No snow? No problem! This bunker is great fun inside or out, snow or no snow. Watch your kids' imaginations soar as they make the fort into whatever they want it to be!